The other day I was craving some soup, and I had some potatoes left over from my Creamy Mashed Potatoes recipe, so Loaded Baked Potato Soup just seemed to hit the spot. I was very hungry though, and had a million things to do, so I needed something fast though. I flipped through my recipe binder and found this quick and easy soup from Kraft Foods. Now please note this is not the best ever Loaded Baked Potato Soup I have ever had, but it was quick and easy, and it wasn't too bad. I did add in some more seasonings because it was a little bland. I was debating on posting this recipe because it is made in the microwave, but since we are keeping it real around here, I figured microwavable recipes needed to be included as well. I am even going to add a tag for future microwavable (aka lazy) recipes. Microwave potatoes in large microwaveable bowl on HIGH 5 min., stirring after 2-1/2 min. Stir in broth and milk. Microwave 10 min., stirring after 5 min. Carefully crush potatoes with potato masher. Please note I then had to microwave again for a few more minutes. The potatoes still seemed a little too hard for my liking. Reserve 2 Tbsp. each bacon and cheese and 1 Tbsp. onions for topping. 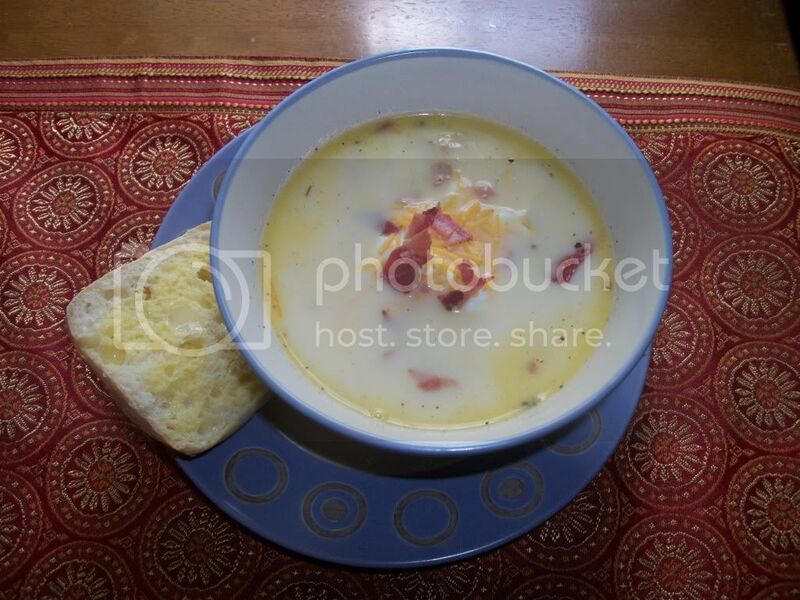 Stir remaining bacon, cheese and onions into soup. Add salt, pepper and any seasonings to taste.